The morning started more than early. According to the plan we were at the Basel train station at 06:25, just in time to buy two tickets. But as if the time of day was not challenging enough, the lady on the train told us that bikes were not allowed. 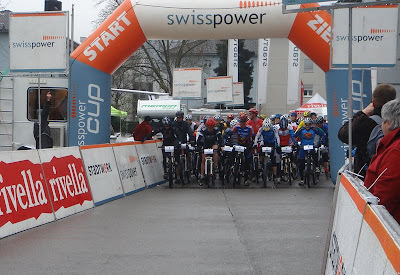 Time was running out, because we had to be in Winterthur latest by 08:15 in order to get start-number and a quick warm-up before the shot of the gun at 09:00. We took a quick decision and I got ahead on the scheduled train to get to the race area on time, and Anja stayed behind with the bike to take the train at 07:07. This way we could get both registered and hopefully get the bike to the race on time. 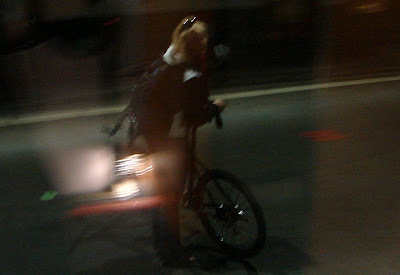 Anja at the Basel SBB at 06:30 in the morning, left behind with the bike. The travel to Winterthur was influenced by the chaotic morning, and we were constantly in contact on the mobiles to make the trip as smooth as possible. When we were halfway on the trip it suddenly started snowing, and I changed in the train toilet to get ready for a real Winter-experience. Charming! When I arrived in Winterthur, the snow had turned to rain. Anja was half an hour behind, but the schedule looked ok. I arrived at the race area, got registered, started warming up and waited anxiously for Anja and the bike. At 08:45 Anja arrived on the bike wet, cold and standing up in the pedals, since the bike was way to big for her. There were around 50 riders in my race, and as we lined up behind the starting line, I found a guy around my size, which I decided to stay close to. The strategy was clear, get through the first two laps in reasonable shape and push as hard as possible on the two last laps. 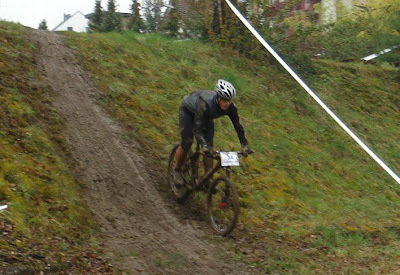 This being only my third real MTB-race I already knew my technical skills as well as my level of power-output would meet its toughest challenge so far. And I was right. After a sprint start over the fist 200 meters, the road turned right and up steep hill with a 15 percent gradient. Over the first 2000 meters we climbed over 150 meters, which is equal to an average climb of 7,5%. The climbs proved not to be the biggest issue. I felt pretty good and passed a couple of riders before we reached the top. At this point I was about in the middle of the pack, but then things got technical. A mix of deep mud, roots and poor technique led me to drop down through the ranks. The forest was really ripped up by the more than 500 riders on the trails the day before. Apparently it had also been raining several days of the week, and I found myself going down face-first more often than Bambi in the Disney Christmas show. Coming to the goal line after the first round, I believed I was among the last ten riders. From thereon I staid more or less the same place in the race, but luckily my technical skills improved throughout the laps. All in all I was down in the mud 6-7 times but Anja told me after the race that I was far from the only one. Unfortunately I ripped my pants in one of the crashes, but my skin feels smooth after the mud-bath treatment. There are no official results in at the moment, but the race was a big success in spite of the morning, the wet and cold weather and the tough ride. Not to mention the 20 minutes I waited in line to clean the bike! But today I learned more about cross-country riding that I have done the whole winter riding the Allschwil forest. 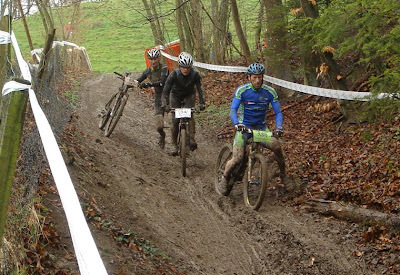 A race on a trail ridden the day before by professionals like Thomas Frischknecht, Christoph Sauser and Florian Vogel was a great experience. I think I would place more or less in the middle when it comes to pure strength, but I got to ride more in demanding conditions. A day like this shows how lucky I am to have a girlfriend that helps and supports me to make this possible even when it means getting up 05:15 in the morning and getting soaked on the hills of Winterthur. Now the only issue is my right foot, where the inflammation has come back, so I will keep it calm until next weekend, where the Swiss Power Cup is in Basel. On Saturday I will try to take advantage of home territory! spændende læsning. og godt kørt...!!! Super beretning og godt kørt:-)! Skønt at se at du på sidste billede er den eneste rytter der er på cyklen, mens de andre kæmper i mudderet - det må være Lefty'en der gør det:-)? Andreas - tjaa det var jo ikke resultatmaessigt nogen kaempe succes, men det havde jeg heldigvis heller ikke regnet med. Proever igen i weekenden! toner - thanks, hope you are watching in the future too. We'll try do more posts in English. Juan - Yeah it might be needed! You can come with me on saturday, the race is near Basel and at four in the afternoon!